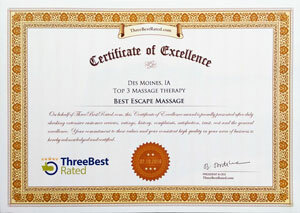 Best Escape Massage performs an array of therapeutic massages and are proud to specialize in advanced wellness treatments. Below is a list of our massage therapy services as well as their descriptions so you can find the perfect treatment for you. $40 / 30 MIN. • $70/60 MIN. • $100/90 MIN. This gentle massage is designed to promote overall relaxation, improve circulation, improve range of motion and relieve muscular tension. A Deep Tissue Massage is a method intended to address the deeper levels of muscle and myofascial tissues (thin film surrounding muscles). Slow, deep movements are intended to release muscle tension, reduce scar tissue, and increase range of motion. This type of massage is recommended for individuals wanting more detailed body work on specific muscle groups. $80 / 30 MIN. • $140/60 MIN. • $200/90 MIN. A 60-minute massage for two is a great way to introduce that special person in your life to the wonderful world of massage. Our Couples Massage provides all the benefits of your preferred massage, side by side with someone special. Sports Massage Therapy can be used as a means to enhance pre-event and reduce post-recovery time for maximum performance during training or after an event. Athletes have discovered that specially designed sports massage promotes flexibility, reduces fatigue, improves endurance helps prevent injuries, and prepares their body and mind for optimal performance. $50 / 30 MIN. • $80/60 MIN. • $110/90 MIN. A Hot Stone Massage is a specialty massage where the therapist uses smooth, heated stones either as an extension of their own hands, or by placing them on the body while they massage other parts of the body. The heat can be both deeply relaxing and help warm up tight muscles so the therapist can work more deeply, more quickly. During pregnancy, regular prenatal massages may not only help you relax, but may also relieve insomnia, joint pain, neck and back pain, leg cramping, and sciatica. Additionally, it can reduce swelling in your hands and feet (as long as that swelling isn’t a result of preeclampsia), and alleviate headaches and sinus congestion — all common pregnancy problems. Raindrop Therapy is a healing technique using Young Living essential oils. Raindrop Therapy combines aromatherapy, reflexology, massage and moist heat to create healing and cleansing through structural and electrical alignment to the body. The purpose of the therapy is to bring total balance, harmony, and body wellness – mental, physical, and emotional. ADD ON: $5 / 30 MIN. • $8 / 45 MIN. • $10 / 60 MIN. • $13 / 75 MIN. • $15 / 90 MIN. A deep tissue massage that incorporates the Ashley Black FasciaBlaster tool and techniques. Fascia is the connective tissue that holds your body together. It surrounds every muscle, runs just under the skin and along the spine. It even holds your blood vessels and nerves in place. When subjected to trauma, like a fall, it will stiffen and restrict movement. Using the fasciablaster is a very gentle process that will facilitate a fascial release for a more effective massage, improved mobility and pain relief. Enjoy Young Living essential oils applied throughout the massage to assist with pain relief, muscle relaxation, stress relief and more! The therapist will choose 2-3 oils to use on the client that will give the greatest impact for the desired results. Customer Comments "Rodney is very knowledgable, listened to my needs and what hurt and worked those knots!! He does give a true deep tissue. Very proffesionable, great reminder service and clean office. I will be back!!"